Emergencies and disasters can happen at any time. Utilities can be out, roads closed, and crucial supplies unavailable. While local, provincial and federal officials prepare for emergencies, individuals can plan to be prepared at home and at work.With the increased levels of fear and anxiety throughout Canada and the world, it makes sense to prepare for the unexpected. 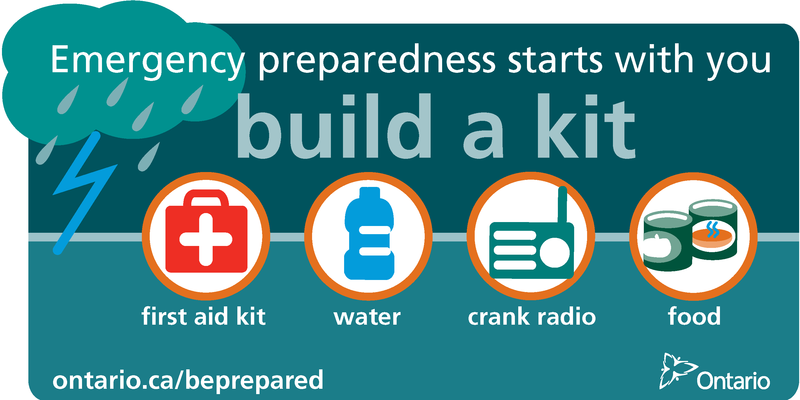 Everyone should be prepared to take care of themselves and their families for up to three days in the event of an emergency or disaster. For example, it could take that long to clear roads due to a severe winter storm.The following are recommended guidelines to assist you in gathering items you should have on hand. Everyone in your family should know where these items are stored.Finally, if you are ever in an emergency situation, Don’t Panic. People have survived three days without water and three weeks without food. Your home can take three hours or more to cool off completely in the winter.The following are suggested three-day emergency supply items per person:Flashlight and batteries, Clothing and footwear,Radio and batteries or crank radio, Blankets or sleeping bags, Spare batteries (for radio or flashlight), Toilet paper and other person items, First-aid kit, Medication, Candles and matches/lighter, Backpack/duffel bag (to hold all of the emergency survival kit items), Important papers (identification), Whistle (to attract attention, if needed),Food and bottled water, Playing cards and games. Achieve the earliest possible response to a local emergency or disaster by using all available required resources. Protect the health, safety, welfare and property of the inhabitants of the emergency area. Provide accurate official information at the earliest possible time to officials involved, citizens and the news media. Request, as deemed necessary, all available assistance and support from other agencies, municipalities, provincial and federal governments.